Rolykit was founded in October 1978 as a limited company with the purpose of developing, manufacturing and distributing durable consumer goods which would be outstanding in design, function and practicality. In the years since the foundation, the company has launched a variety of plastic consumer products, the first being the famous ROLYKIT, a cleverly designed compact storage box that, when "rolled out" provides a large number of compartments which can hold any kind of small parts like bolts, screws, nuts, etc. When rolled up, the box has a hexagonal shape and keeps all items stored inside neatly at their place through a clever locking mechanism. This special feature of the rolling storage is patented in over 30 countries worldwide and the hexagonal shape became the registered trade-mark of the company. Other products developed and succesfully marketed formed a range of products aimed at the storage of audio/video- and computer accessories. As CD/DVD storage changed to mp3 and the like, the production of these items was discontinued. Apart from the regular product series, Rolykit is also specialized in custom molding projects. 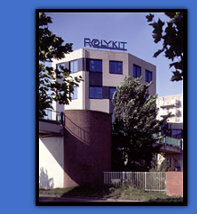 In the late 80-ies Rolykit developed a large cosmetic demonstration kit for Avon Cosmetics, U.S.A., which won a design award in Chicago, U.S.A.
Other companies that used the know-how of Rolykit to make their special projects a success are Bruynzeel, Nenitec, Agfa Gevaert, WH Smith, Office Data, Rabo Bank, L'Oreal, Avon.